Altrincham Preparatory School boys marked the centenary of the Armistice by holding a special assembly in school and taking part in an Act of Remembrance at St Mary’s Church, Bowdon. Led by Senior Master Mr Birch, the boys read from some of their recent classroom work on World War I and the Armistice before reciting Everyone Sang by Siegfried Sassoon. The Senior Choir performed My Song Is Love Unknown by John Ireland - who was born less than a mile from APS - and after a poignant Last Post from Halle Orchestra’s Principle Trumpet Gareth Small, the boys all sang a beautiful version of the famous poem by John McCrae, In Flanders Fields. 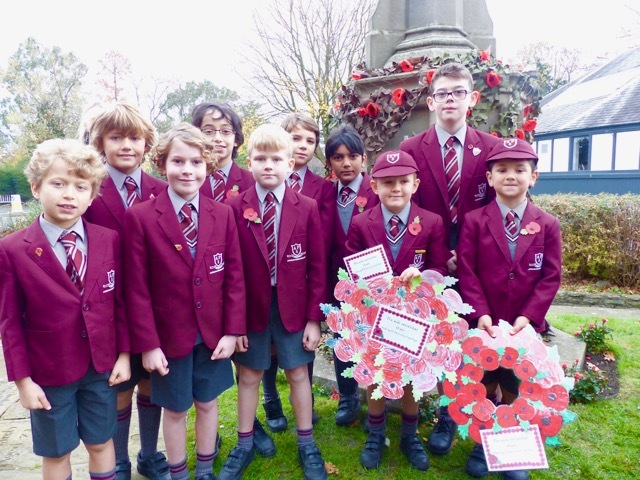 In the weeks preceding the assembly, the boys had worked hard on poppy wreaths during art lessons, which were taken by a School Council representative from each year group to be laid at the war memorial outside St Mary’s. The wreath laying was part of a beautifully-observed short service, where Revd Ian Rumsey spoke to Reception, Year 1 and Year 2 boys at APS about the 71 poppies draped around the memorial, which commemorate the people who went to war from the parish and didn’t come back.